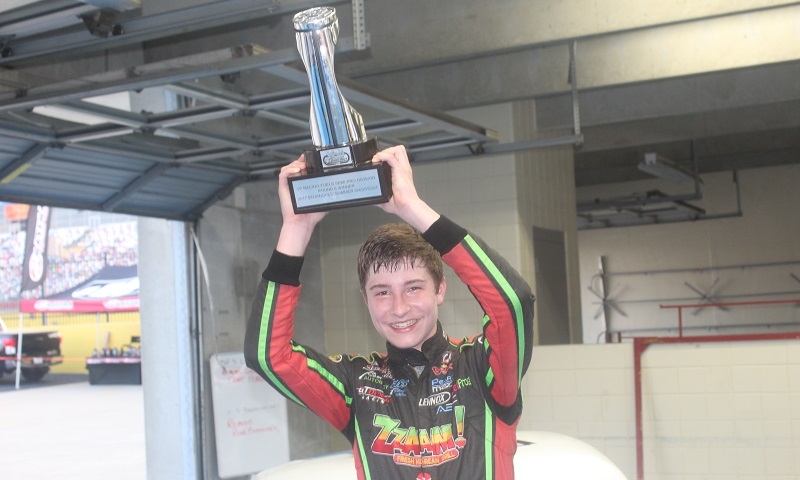 CONCORD, N.C. — One week ago, Garrett Manes was signing autographs on the frontstretch at Charlotte Motor Speedway convinced that his time at the Bojangles’ Summer Shootout was over after the track’s Fourth of July fireworks display. After all, he had just climbed from a harrowing flip down the frontstretch that destroyed the only Legends car in his stable, an incident hard enough that it cracked the left rear corner of the car clean from the rest of the body. However through a little faith, a lot of signatures and several giving hearts, Manes was able not only to return to the Shootout for another try on Tuesday night, he was able to take home the ultimate prizes: redemption and a trophy. But before talking about the win, let’s back-track a moment. Manes’ night in round five on July 4 came to an end after contact with Ryan Miller led to his car turning over down the frontstretch and sustaining massive damage before it came to a halt. 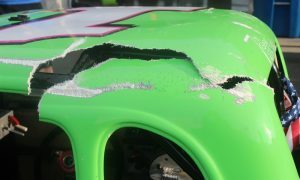 While most of his competitors were signing autographs with their race cars at the conclusion of the night, Manes was sitting on the frontstretch SAFER Barrier, with the hood of his car propped next to him as he signed because “it was the only piece of the car that wasn’t broken,” Manes laughed. Enter several fans sympathetic to his situation, who received autographs and then later messaged Manes’ Facebook page saying they were raising money to help him get back on track. The money raised from the crowdfunding efforts, plus money out of the family savings account, was enough to scrape together and get a new car for Manes to return for round six on Tuesday night. In contrast to his former mount, which was painted in pink and green as a nod to longtime sponsor SweetFrog Frozen Yogurt, this machine was flat white with blue trim on the number decals. It wasn’t flashy, but it was fast. Manes qualified fourth overall and then started third after the invert pill was drawn, charging to the lead by lap three of the 25-lap main in an effort that had fans on their feet and cheering for a potential Cinderella script.